Cars from the 1980s were weird. Some felt like relics from the 1970s struggling to fit in while others dabbled in faux digitization. Bring up the 1980s, and there are a few cars that elicit excitement, but there’s one that earns nearly universal praise—the Buick Grand National. At the time, it was the performance car of its era, putting the hurt on the Mustang, Camaro, and Corvette. But that’s not all. It also earned respect from the Lamborghini Countach, and those pony-logo Italian supercars from Maranello. Pristine examples are coveted in the community, and this January, you’ll have the opportunity to own two. Barrett-Jackson Scottsdale Auction will host “The Twinz,” a pair of 1987 Buick Grand National coupes. But there’s more to them than meets the eye. Both have been in storage, collecting plenty of dust and few miles. They also have sequential VINs, too. One has less than 900 miles while the other has less than 600. And both will sell as a pair at no reserve. Power comes from a 3.8-liter turbocharged V6 engine producing 245 horsepower. That may not seem like much, but at the time, when automakers were meeting stricter emission regulations and make the switch to electronic fuel injection, it was plenty. The engine pairs with a four-speed automatic. At the time, Car and Driver clocked the Buick hitting 60 miles per hour from zero in 4.9 seconds. According to the listing, both come with their original window stickers and other factory documents. 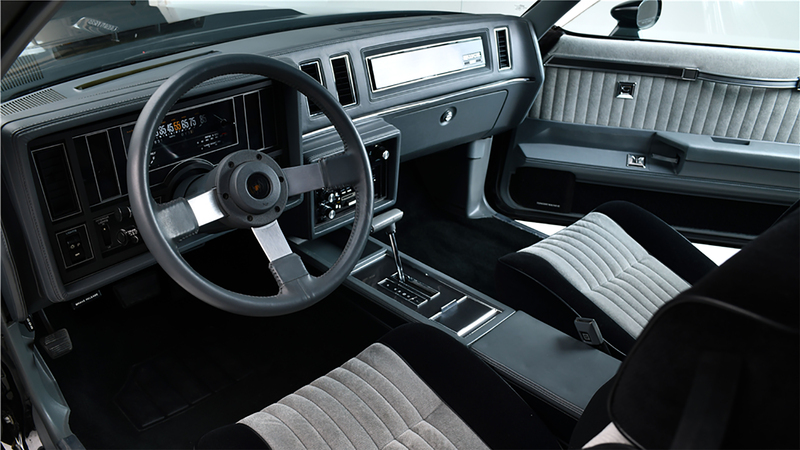 Other features include power driver’s seat, power windows and locks, G80 posi-traction rear differential, and original Goodyear Eagle tires. Both have black paint and matching grey interiors. It appears these are the same Buicks that sold earlier this year for $205,000. It’s rare enough when one example comes up for sale. Two with sequential VINs in like-new condition with less than 1,000 miles feels like winning the lottery. Whoever buys the pair will have quite the collection. If I had the money…..always LOVED these cars.